Hactl COO Tan Chee Hong will reveal the culture of service quality and exceeding customer expectations that propelled the group's Hong Kong ground handling operation to the world's Best Station crown in a keynote presentation to be given at GHI's 12th Asian Conference, Kuala Lumpur on March 20. 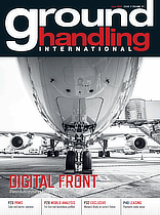 Hactl's team scooped the Best Station award at GHI's Pride of Ground Handling Awards last November with judges praising the team’s performance as "near flawless". Chee Hong will detail how an engaged and highly skilled employee base was instrumental to achieving success. Hactl maintained world-class OTP in the face of a 60% rise in handling volumes last year. The station also reported no incidents of ground damage across 30,000 freighters handled and received 27 unsolicited thank you letters and emails from airline customers last year. The presentation will explore how Hactl aligned high levels of employee engagement with key performance indicators like safety and OTP. The session will also examine the role of a comprehensive training plan in enabling service improvement. The presentation is among the highlights of GHI's 12th Asian Conference programme, which takes place from 19-21 March. Almost 400 aviation stakeholders across the Asia region will gather at the KLCC, Kuala Lumpur, to exchange best practice and discuss new business opportunities.